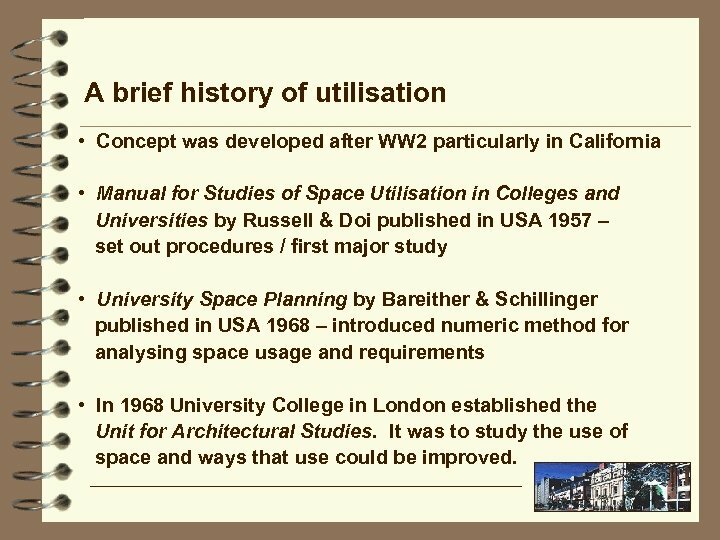 A brief history of utilisation • Concept was developed after WW 2 particularly in California • Manual for Studies of Space Utilisation in Colleges and Universities by Russell & Doi published in USA 1957 – set out procedures / first major study • University Space Planning by Bareither & Schillinger published in USA 1968 – introduced numeric method for analysing space usage and requirements • In 1968 University College in London established the Unit for Architectural Studies. 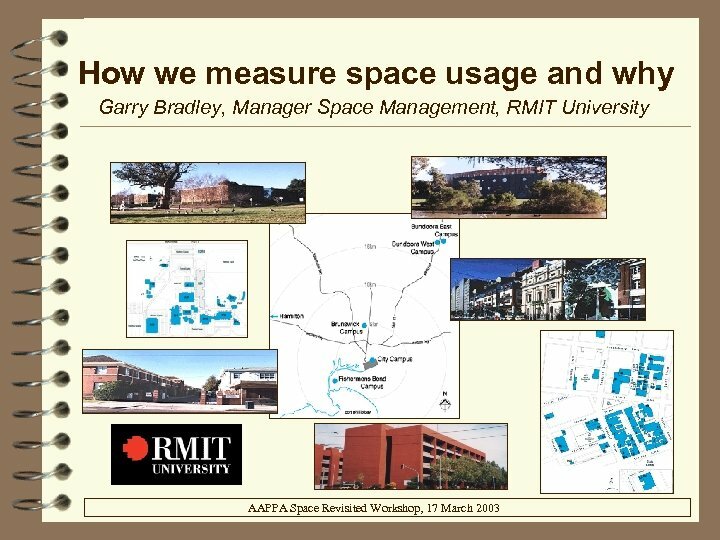 It was to study the use of space and ways that use could be improved. 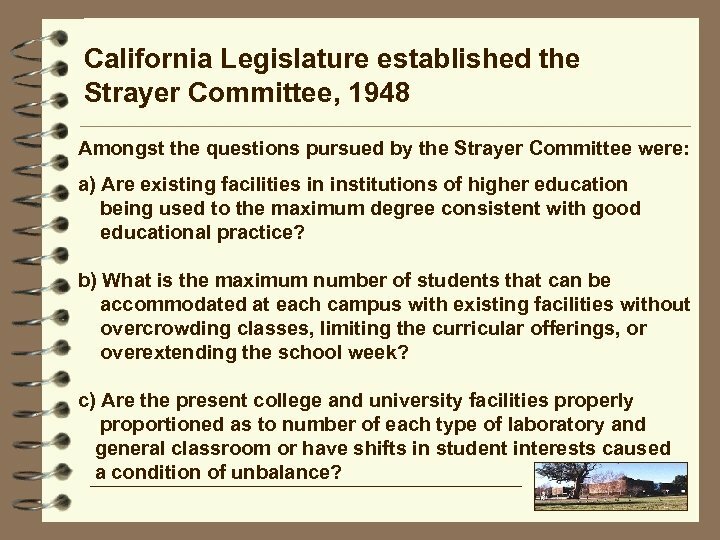 California Legislature established the Strayer Committee, 1948 Amongst the questions pursued by the Strayer Committee were: a) Are existing facilities in institutions of higher education being used to the maximum degree consistent with good educational practice? 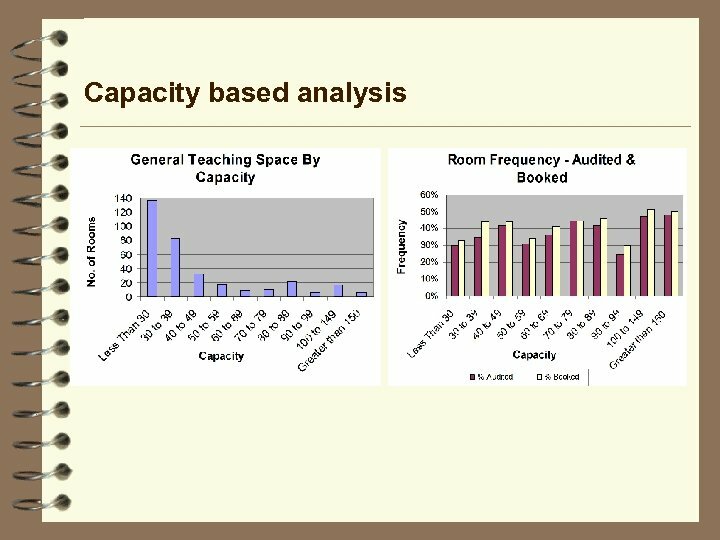 b) What is the maximum number of students that can be accommodated at each campus with existing facilities without overcrowding classes, limiting the curricular offerings, or overextending the school week? 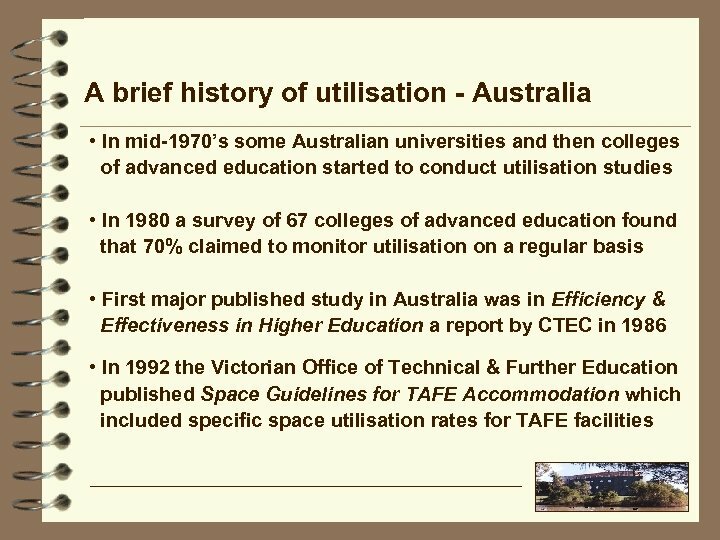 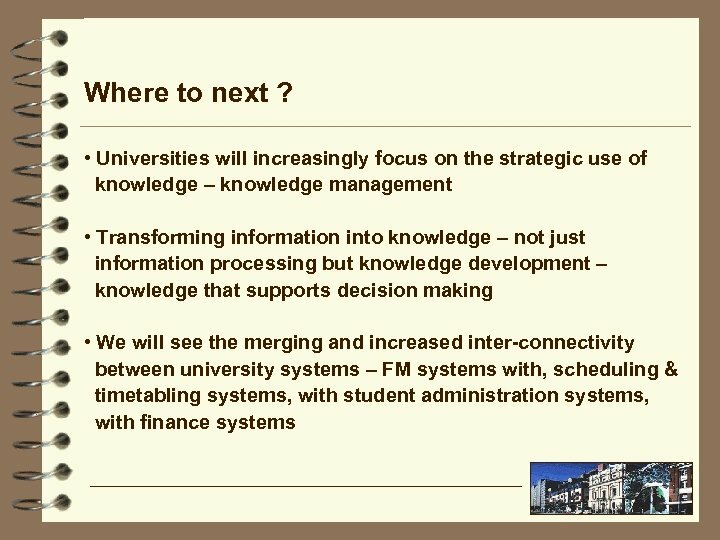 c) Are the present college and university facilities properly proportioned as to number of each type of laboratory and general classroom or have shifts in student interests caused a condition of unbalance? 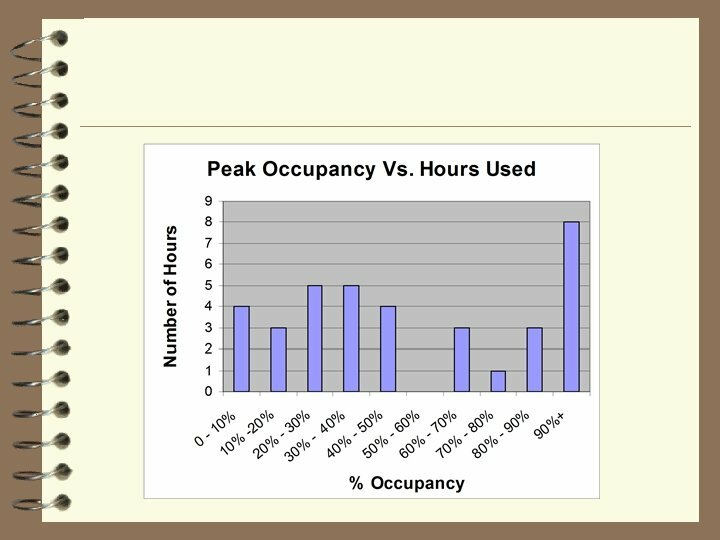 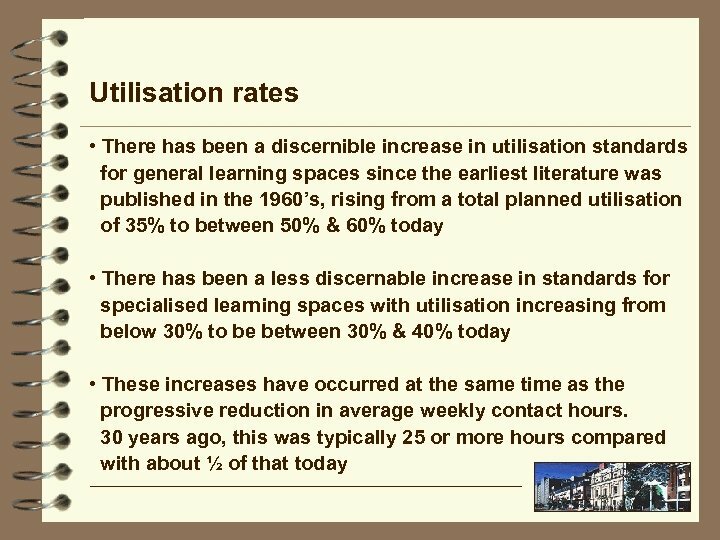 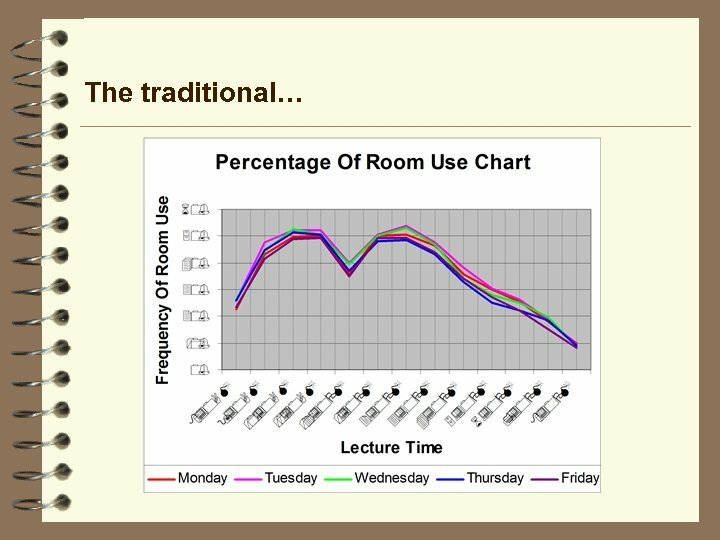 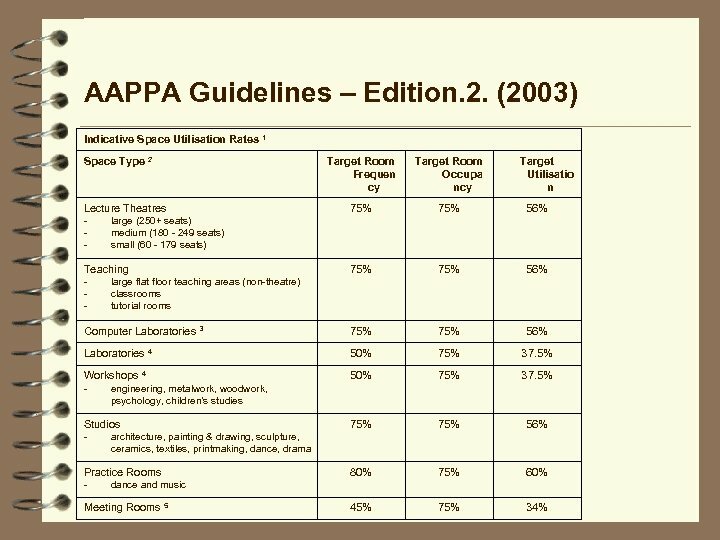 Factors affecting utilisation rates • Physical nature of the space, eg. 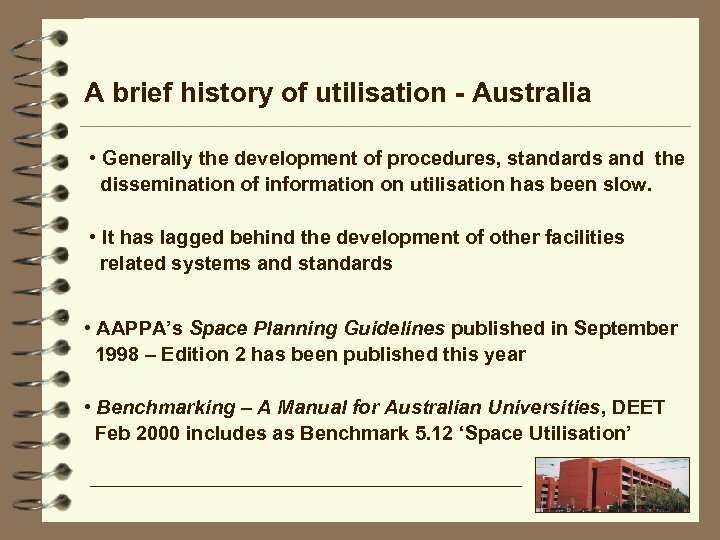 Condition, location, supply of similar facilities, capacity, technological obsolescence, …. 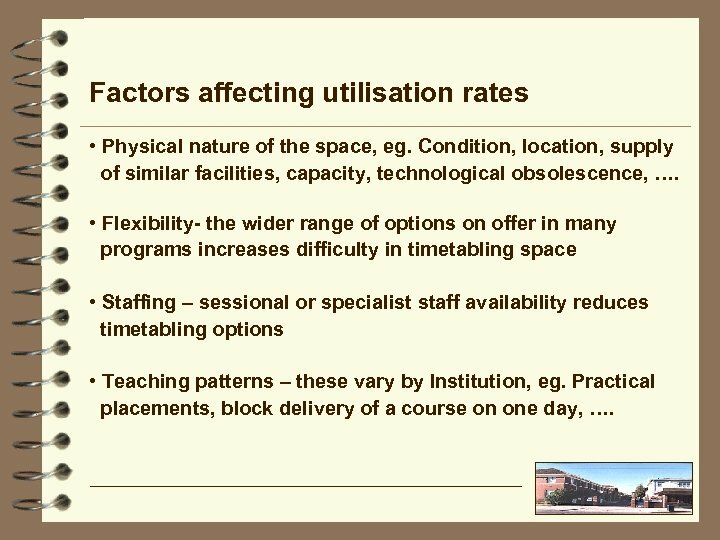 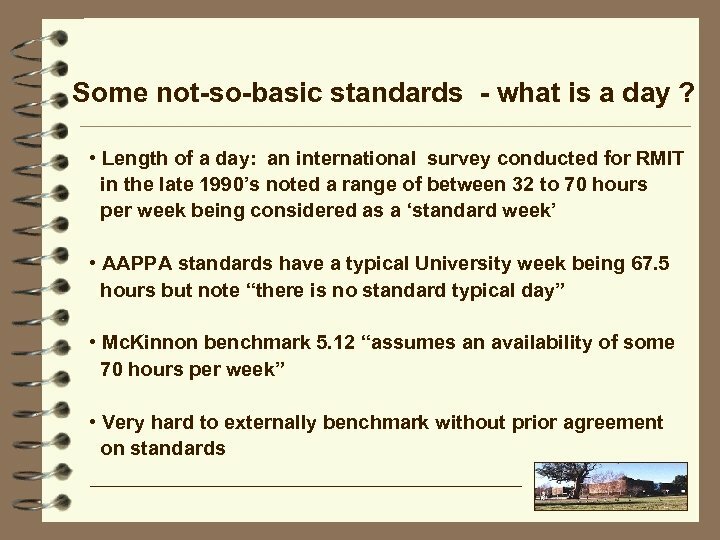 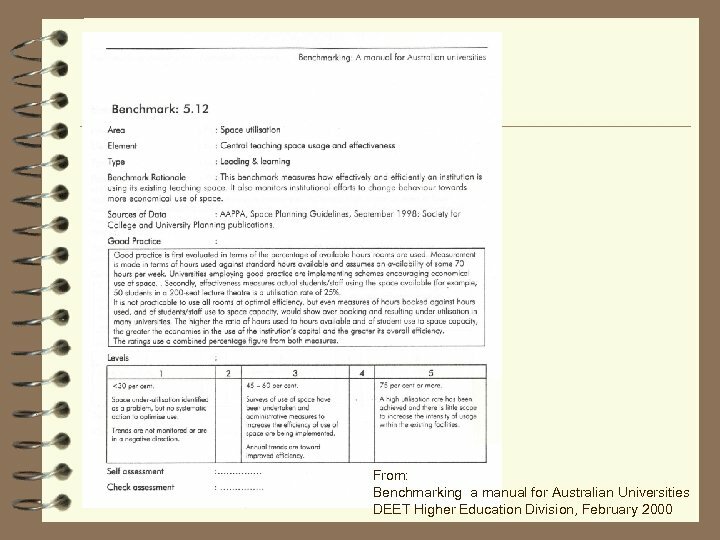 • Flexibility- the wider range of options on offer in many programs increases difficulty in timetabling space • Staffing – sessional or specialist staff availability reduces timetabling options • Teaching patterns – these vary by Institution, eg. 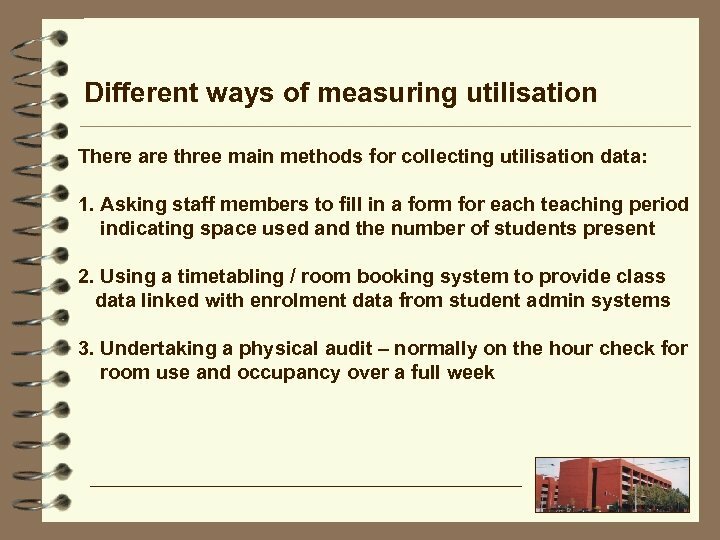 Practical placements, block delivery of a course on one day, ….